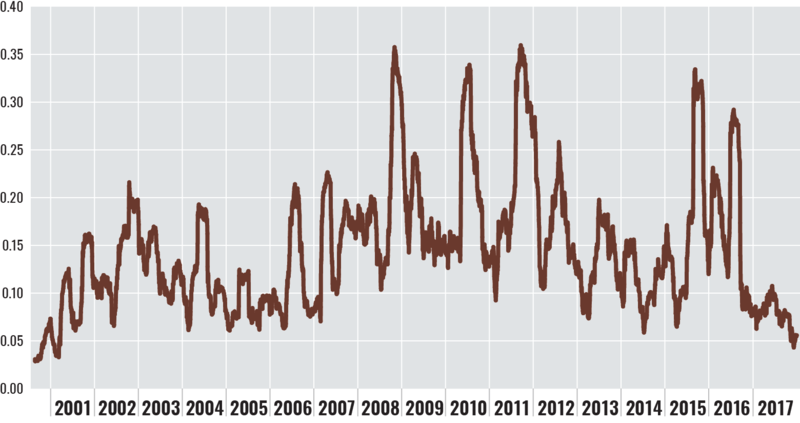 RiskWatch provides recent data on volatility and correlation, the two components of risk, for U.S. and global equity and fixed-income markets. The equity data are derived from Axioma's medium-term fundamental risk models. One set of tables is designed to capture U.S. market sectors plus countries and currencies with the highest and lowest levels of volatility and how that component of risk has changed since the end of the prior quarter. The highest and lowest correlated countries within developed and emerging markets are also highlighted. Another table illustrates how currency volatility can be a major driver of risk in multicountry benchmarks and can often change substantially from one quarter to the next. The fixed-income data, detailed in the multiasset-class section, consist of U.S. and eurozone government yields, investment-grade and subinvestment-grade spreads as well as correlations among those asset classes and selected currencies. Note that the following charts are now using Axioma's new WW4 (worldwide) model: predicted volatility by currency, predicted volatility by country and country-country correlations. Data are as of Dec. 29, 2017. Change compares to the previous quarter. Correlations measure how closely stocks move together. High correlations suggest that some global force (such as a financial crisis) is pushing all stocks in the same direction. When the correlation is low — as we see currently — it suggests that each stock move is based on its own characteristics, not a theme. Low correlation theoretically is better for stock-pickers because prices change based on their fundamentals; that also serves to keep overall volatility low (one stock rises and the other falls but the combination of the two doesn't move). This chart shows the median correlation of 60-day returns across all asset pairs in the FTSE Developed index. U.S. and euro spread curves are defined as the spread over the swap curve (previously spread over the government curve). 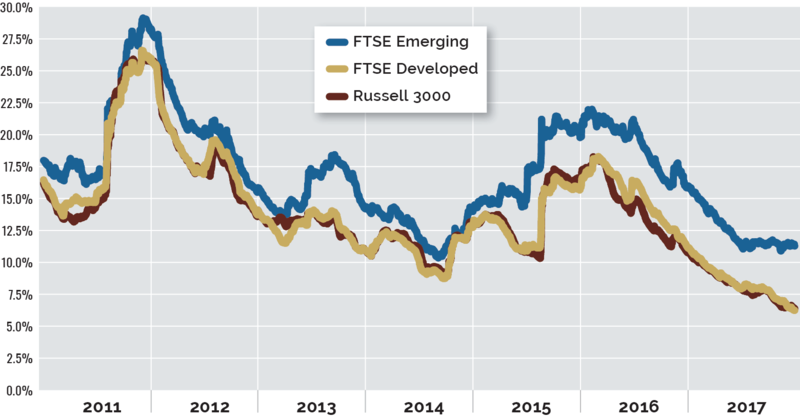 Emerging markets sections include only countries in the FTSE Emerging Markets index. ***In excess of the global market. Commentary: A new era for the Korean peninsula?